"It is wonderful that five thousand years have now elapsed since the creation of the world, and still it is undecided whether or not there has ever been an instance of the spirit of any person appearing after death. All argument is against it; but all belief is for it." 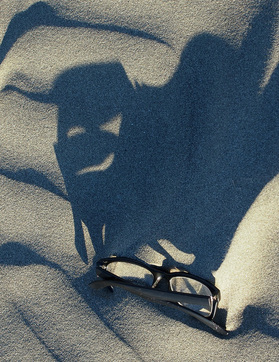 Experiences of paranormal events are sporadic and unpredictable, and usually unrepeatable. Their examination presents a different kind of challenge to many of the controlled, repeatable events that are amenable to testing by established Scientific Method. Also, much so-called research into the paranormal is conducted using flawed, unsound, unscientific methods. For these reasons, most paranormal research and investigation falls into the category of pseudoscience - literally, 'false science'. What is Scientific Method? We agree; this is unfortunately true. While we can develop and test hypotheses, it is not currently possible to develop proper theories about paranormal phenomena because we don't have access to identifiable, controllable phenomena to experiment on. For example, we cannot test a theory that predicts that when a spirit materialises there will be a local temperature decrease, because we cannot reliably produce a spirit to experiment with. (We're using the word Theory here in the scientific sense, not to mean a vague idea or guess.) So, how then do we proceed? 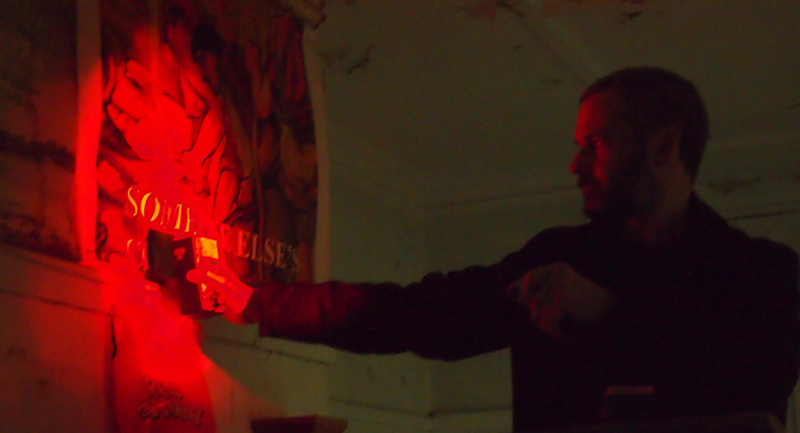 During an investigation we take a lot of take still photographs, video footage, and record digital and analogue sound. This is mainly for general and specific documentation of the site and our team's activities, but also in the hope of obtaining hard data as evidence of a paranormal phenomenon occurring. We employ a method of examining sites that involves some investigators having no foreknowledge of reported paranormal experiences or the history of the location. Taking care to avoid contamination by leading, this enables us to later weigh their more objective observations against those of investigators who are looking for specific things. We also work in pairs or groups during investigations, never alone. This is for safety reasons as well as for evidence-gathering (one person can only handle so many recording devices) and for later corroboration of observations. We examine all our recordings closely for unusual effects. A single inexplicable event caught on camera or audio will not prove there's a ghost; but if it coincides with other evidence such as unusual EMF readings, temperature fluctuations, things we observe with our own senses, then the cumulative evidence (hard and soft) may suggest something strange has occurred, and hopefully carry some weight. Rather than stand as proof, this would more likely just provide a basis for further investigation. Also, repeated observations of similar phenomena in the same location may add up to be significant, but only if we can ascertain the independence of the observations. .To make things even more difficult, we are far from convinced that ghosts (or most other paranormal phenomena for that matter) can even have any physical, measurable effect in the world. It could be that their presence is only detectable by humans, and not at all by using instruments; or that it is largely influenced by the presence of people; or is purely the result of human brain activity; or is merely a product of the imagination. We really do not know. We may be totally wasting our time seeking to detect and record ghostly presences and communications, but it is compelling and fascinating to try. As well as trying to find out if ghosts have a physical nature, or that they exist in a wider, objective reality rather than just as personal, subjective experiences, we are very interested in how and why people experience ghosts. In contrast with the physical side of things, there is no doubt that people do have experiences of ghosts of one sort or another. Most of us in the Strange Occurrences team have had our own ghostly or other paranormal experiences, many of which we are still seeking explanations for (despite being well versed on all of the skeptics' standard explanations). Our own experiences, and more importantly your experiences, are what keep us interested. Also, it is important to us that we're not perceived as anti-science (as, unfortunately, many paranormalists are). While we remain open to most perspectives and viewpoints on the paranormal, including and respecting those based on spiritual and religious beliefs, we think that science will eventually provide solutions to the problems of describing and understanding the paranormal, whether scientists are asking the same questions as we are, and deliberately, actively seeking these answers, or not. Once scientifically described, explained and understood, the paranormal becomes the normal. 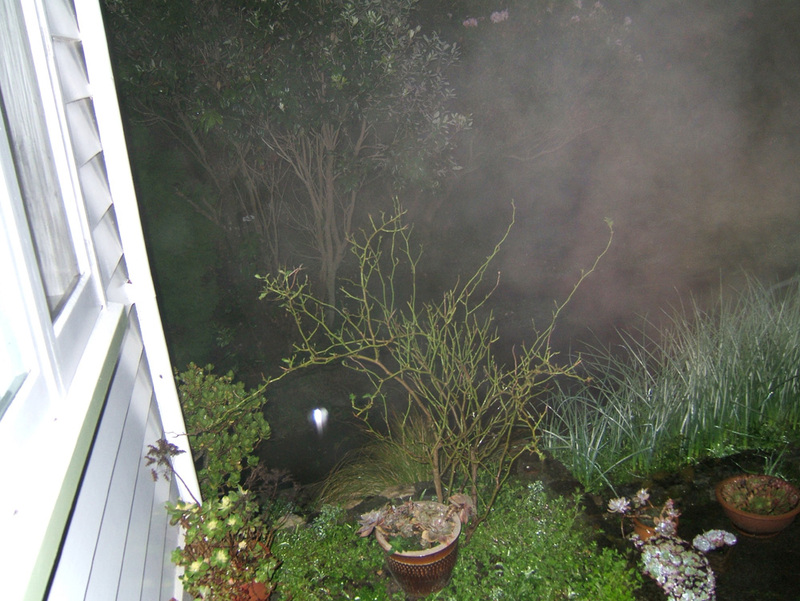 Photo taken while deliberating exhaling over the camera on a cold night, to show how misty breath looks when the camera flash hits it. The strange little orb in the photo above. Click on this photo to view it at 100% pixel size of original camera file (cropped to orb area). Photo taken out in the rain, with flash. 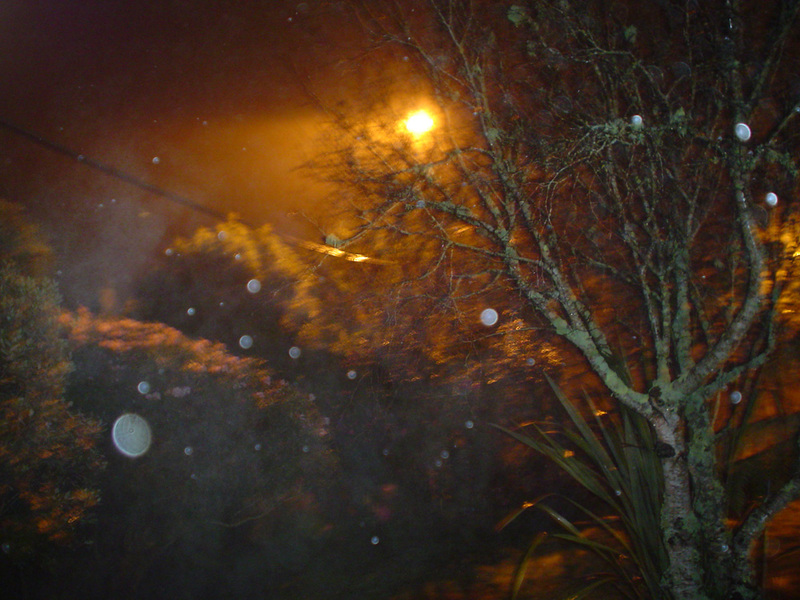 The orbs are caused by the flash reflecting off the raindrops and showing up as Circles of Confusion in the image. 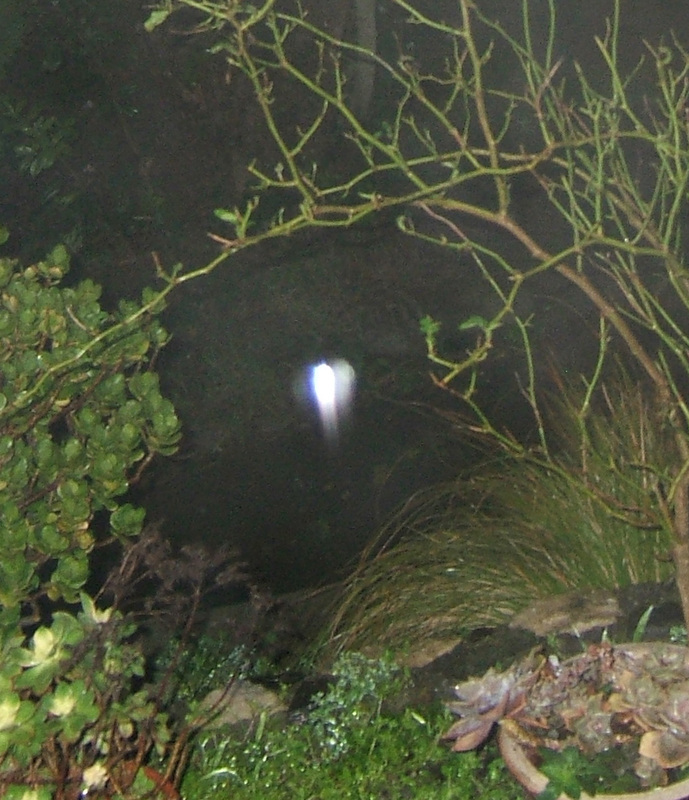 For more on this, see link below - Orbs Explained.